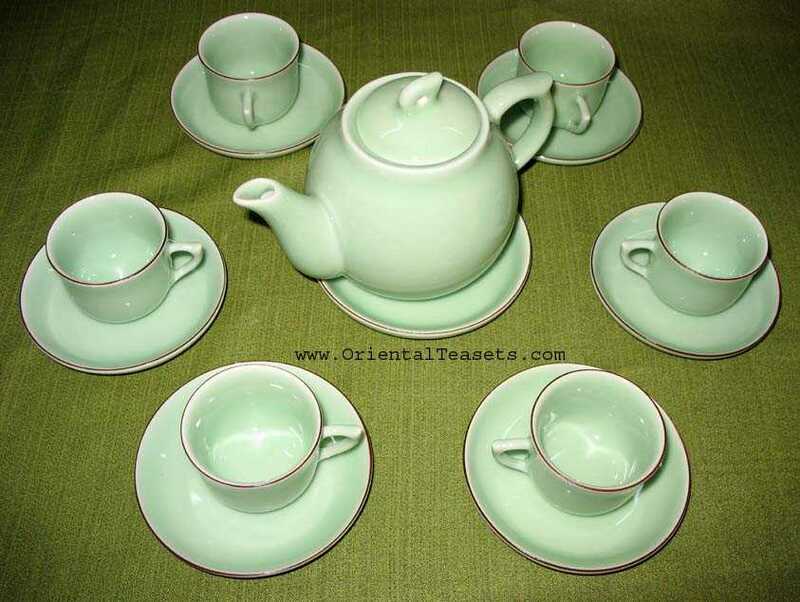 Elegant light green tea set, great for green tea!!! Hand made and hand painted in Vietnam. Tea is popular as water in Vietnam. In every Vietnamese house, restaurant, or even office, people always a tea set available. Tea sets vary from small tiny tea sets for decoration or for ancestor altars, simple tea sets with earth tone enamels the in rural houses, to the fancy, beautiful tea sets that Vietnamese people only use for special guess. An authentic tea set is a hand made one. Each piece of the set is hand shaped, has a charm and a little bit different from each other which create the “soul” of the tea set. This “life” cannot exist in the mass produce tea sets which every pots, every cups come from the same mold. A authentic tea set must be hand painted. You will never be bored to look at an authentic tea set because of is beauty. Tea sets are not only used for tea serving, but also as a home décor. Here is our tea sets collection from Bat Trang, a famous pottery village in the north of Vietnam, with the best quality you could find in Bat Trang and authentic, artistic designs (classical and modern designs). In order to provide the best quality and the most beautiful Vietnamese tea sets, each tea set is hand made by the high skilled potters from the Bat Trang’s families (who have long history of making tea sets and good reputation) and carefully inspected before shipping to the United States.